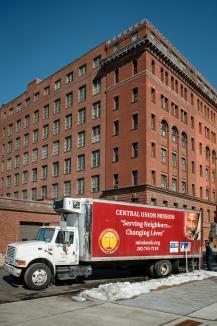 In 2013, Central Union Mission relocated into a new facility located at the former, historic Gales School building in DC’s Ward 1. The new facility allowed the Mission to expand their programs and services to include an additional 26,000 meals served and provide safe sleeping accommodations for an additional 9,500 clients, as well as provide educational and counseling services to an additional 1,190 clients. Included are new classrooms with state of the art technology, expanded medical, legal, dental, and caseworker offices, and a new fitness center. In addition to the increased number of sleeping beds in a partition type arrangement, the new location also offers private rooms in suites, each with a bathroom to help clients transition from the shelter to more traditional housing. These suites are also available for residential staff as necessary. Finally, the new facility includes an upgraded and expanded professional kitchen. City First Bank partnered with Central Union Mission to fund this project through the bank’s New Market Tax Credit program. The project created approximately 100 construction jobs, 16 full time jobs and 10 part time jobs. The restoration of the Gales School also rescued a historic building and supported the revitalization of the Union Station community. When planning the renovation, project leaders focused on building environmental sustainability including setting aside 20% of the outdoor space as public open space, cleaning of a brown-field, and use of recycled materials for at least 50% of the project materials.